I saw Alien: Covenant on the big screen this summer in Budapest. I didn’t write a review then, because another reviewer had it covered . But having seen it for a second time, now on Blu-ray, I feel moved to comment. Covenant is an excellent film, indeed the best in the series since Scott started it with his path-breaking Alien (1979) — although James Cameron’s Aliens is excellent and iconic in its own right. Covenant is set 10 years after Prometheus. Perhaps because Scott came to realize that Prometheus is God-awful, he basically abandoned as much of the detritus as he could, including Lindelof. 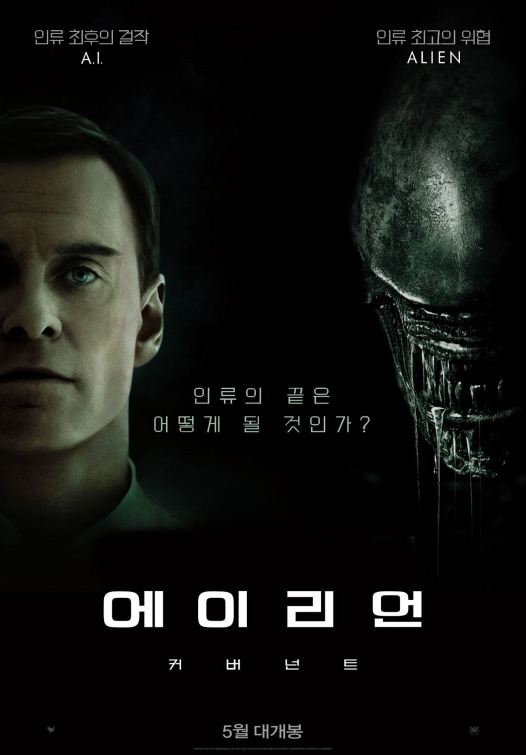 The only characters who remain from Prometheus are Guy Pearce’s Peter Weyland (who appears only in the prologue) and Michael Fassbender as the android David. Scott couldn’t really abandon the conceit of explaining the xenomorphs, but the end of Covenant does not set up the beginning of Alien. (The ship that crashes in Covenant cannot be the ship that is found in Alien.) So we are all left wondering. It is as if, after the debacle of Prometheus, Scott decided to simply make the best possible movie, “franchise” continuity be damned. I’m not complaining one bit. The script of Covenant is intelligent and highly literary, weaving in Wagner, Milton, and Shelley. 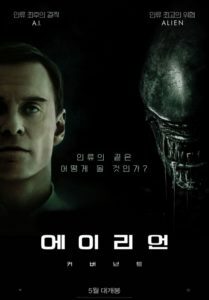 The music by Australian rock musician Jed Kurzel is effective, utilizing Jerry Goldsmith’s haunting, Debussy-like main theme from the original Alien. The visual style and effects are simply dazzling, with spectacular location shots, superb sets, models, and paintings, and a minimum of digital trickery. The detail and feeling of realism on the large screen were stunning. I especially appreciated the recreation of Böcklin’s The Isle of the Dead. Simply as a feast for the eyes, Covenant offers scene after scene that will fill you with wonder and delight, as well as sheer visceral terror. When we finally set down on a hostile planet, we are nearly an hour into the film. Then things get pretty frenzied, and, aside from a couple of calm interludes, the suspense and action never let up until the end. The aliens are genuinely terrifying: both the classic xenomorphs and the so-called “neomorphs,” which are new to us but “paleomorphs” evolutionarily speaking. And although much here pays homage to elements of Alien and Aliens, where it counts, Covenant is a genuinely imaginative and original film. Scott is a highly PC director. Remember, this is the guy who brought us Thelma and Louise and G.I. Jane. But there are some subversive elements to Covenant. First, the 14-member crew of the Covenant consists of 5 women and 9 men. There are at least five married couples, including a black man with a white wife and a couple of macho homosexuals. This is a plot in which bad decisions lead to disaster. Predictably, when one spouse is in danger, the other becomes emotional and makes bad decisions, and it only gets worse as spouses start dying horribly. The biggest catastrophe, though, happens because two women who are left in charge go completely to pieces in a crisis. Some have pointed out that the race-mixers get their comeuppance, but so does practically everyone else, so there is no moral there. The final scene of Covenant is magnificent and far more terrifying than the giant bugs. Having placed the two surviving crew members into stasis, David, who earlier complained that his experiments lacked only one thing — human test subjects — enters into the compartment where two thousand colonists and more than a thousand human embryos are stored in stasis, accompanied by Wagner’s magnificent “Entry of the Gods into Valhalla.” Then he vomits up two xenomorph embryos and places them among the human ones, like a cuckoo laying its eggs in an unwitting host’s nest. Buttercup Dew is right to see Covenant as an unconscious anti-Semitic allegory, and the final scene encapsulates the full horror we all feel at the spectacle of our sleeping race being turned into experimental playthings then corpses by beings that look huwyte on the outside but operate on a misanthropic, genocidal code on the inside. Frankly, I hope the Alien franchise ends here, on the highest note since it began 38 years ago. At the age of 79, Ridley Scott has made more bad movies than good ones. But when he’s good — Alien, Blade Runner, Blackhawk Down, Kingdom of Heaven, The Martian — hoo-boy. With Covenant, Scott can retire with us all wanting more.